'Being Serena' Is A Sweet, If Incomplete, Picture Of Greatness You won't find anything terribly surprising in HBO's series about the private side of Serena Williams, at least at first. But what you will find is a willfully pleasing self-portrait. 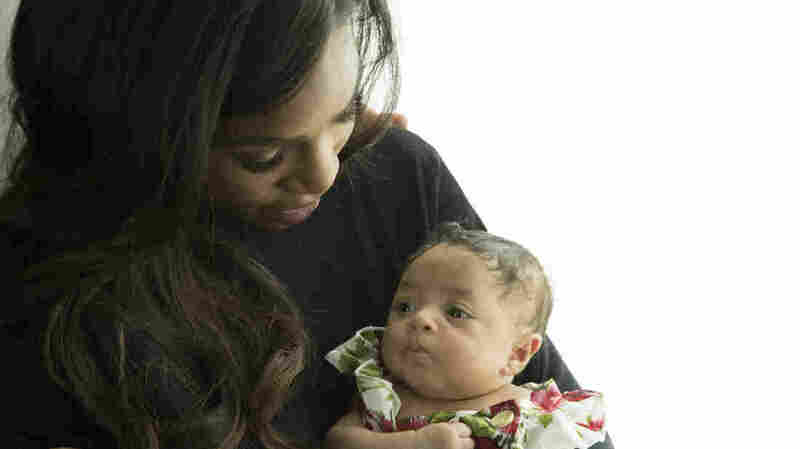 Serena Williams and her daughter, in HBO's new sports series Being Serena. One useful rule of documentaries or quasi-documentaries is: be suspicious of the ones with voice-overs by their subjects. At the very least, be aware that these subjects are being allowed to frame their own stories, so whatever you see is an autobiography of a kind, an assisted self-portrait. In the case of HBO's Being Serena, the series is a collaboration between HBO and the content-producing arm IMG, which belongs to the same sprawling talent management empire that represents Serena Williams. (To use a very, very oversimplified comparison, it's like Jerry Maguire's company helping make a series about Rod Tidwell.) So adjust your expectations accordingly. In fact, Being Serena opens with a Serena Williams voice-over, and then an interview in which she explains that she found out she was pregnant when she was about to play in the Australian Open. It's clear from these opening moments that it's far from an arm's-length observer's document. It is, instead, her story in her own words, and in footage that's often a higher-quality version of home movies. But if you enter into the series knowing it to be less a documentary than a diary kept by one of the greatest athletes of all time and a promotion for her brand, it still has its charms. What Williams wants to do here, in addition to (it's fair to assume) polish her image in the same way everyone in the public eye is given to doing, is to tell the story, in her own words, of being pregnant at the height of her powers. She chooses where to place the focus, so the first two episodes (the ones HBO made available to critics) zoom right from the moment she discovered she was pregnant to the end of her pregnancy and the birth of her daughter Olympia. Williams' history with blood clots complicated her pregnancy in some respects, and the series shows her fears and her frustrations at having her activity restricted while those concerns are addressed. The framing is pure television: her daughter's father, Alexis Ohanion, is introduced as her fiance, and he explains his admiration of her and how he's really just a nerd who found a great love. He may well be all those things, but he is also a co-founder of Reddit and a tech investor, which doesn't really come up in the early going. Indeed, this is her story, and there's no reason for it to be about him. But if you are going to introduce him at all, "besotted nerd" is a very ... particular way to do it. Skepticism aside, though, there's a lot to like. By necessity, a series that follows an elite athlete through pregnancy, childbirth, a wedding, and her return to competition takes as its subject, much of the time, her body. One of the intriguing parts of Being Serena is that visually, it worships her athleticism but respects the work it takes for her to look perfect all the time in pictures. You will see her without makeup, but you will also see her put on her makeup. She is candid about her public and private faces, her public and private bodies. The traditional grace of Serena the athlete sits comfortably alongside not only her very pregnant self, but also her during-childbirth and just-after-childbirth selves, which look very differently, but just as unmistakably, graceful. The first two half-hour episodes don't reveal anything unexpected about Williams, but they offer little glimpses that are a lot of fun, particularly for her many fans. You see her father come to meet her daughter, you see her working out while very, very pregnant, and you see her sing — rather adorably — to her baby and pets. If you like Serena Williams and you like the idea of passing uncomplicated time soaking in her charisma (and her blinding excellence), there's no reason to resist. Don't expect a comprehensive documentary about her career. Expect a story about one way to become a parent, one way to think about having a child, and one unique explanation of excelling at the Australian Open: Ohanian says he thinks the reason she didn't drop a set at the event is that she had just found out she was pregnant (and been cleared to play by the doctor), and she wanted to get off the court as soon as possible because it would be better for the baby. As with everything else here, that's one way to do it. "Being Serena" premieres Wednesday, May 2 on HBO.